Location: At the end of a Station Road. The station straddled Castle Road at its north end. Present state: The south end of the station and the goods yard are now a lorry park; only the cattle dock survives. To the north of Castle Road industrial units occupy the station site. The stationmaster's house is in private occupation. Notes: Pencader station was well sited in the centre of the small village with a population of little more than 500, two shops and two pubs. The main industry of the area has always been primarily agriculture with two woollen mills close to the station. Pencader station opened on 28 March 1864 when the Carmarthen & Cardigan Railway was extended from its temporary terminus at Conwil. The station was built into the side of a valley, which required a retaining wall and some timber buttressing on the down side. The station had a passing loop and two facing platforms reached from a forecourt at the end of Station Road. The main building was an unusual design comprising a weather-boarded single-storey structure with a ridged slate roof, from which a central section projected and presented gable-ends, with two windows, to the platform and station forecourt. Awnings sloped downwards in front of the building either side of the central gabled section. The station included a booking office, general waiting room and a ladies’ waiting room. The gents' toilet was a small brick building beneath a pitched slate roof with an air vent, at the north end of the main station building. There was a large timber waiting room with a sloping roof and awning on the down platform. The rear of the building overhung the valley below and rested on five timber piles. This building was later replaced with a much smaller timber waiting room with a pitched slate roof. Initially, passengers had to use a barrow crossing at the south end of the station to reach the down platform, but around the turn of the twentieth century a covered footbridge was provided. Pencader had one of the larger goods yards on the southern end of the line. The yard was to the south of the station on the up side and comprised three south-facing sidings and two facing north. One of these sidings served a cattle dock and pens while another passed through a large stone goods shed terminating on the station forecourt behind the main station building. From this siding, a short tramway, assumed to be narrow-gauge, ran to a saw-mill at the back of the station forecourt. The yard handled large quantities of timber and was provided with a 1 ton 10 cwt crane. Initially there was no signal box but a large two-storey type GW25 box was built at the south end of the down platform some time c. September 1894. There were water cranes at the end of both platforms and a water tank at the back of the goods yard behind the goods shed. DSM Barrie- an acknowledged expert - states a third rail was laid to enable M&MR trains to reach Carmarthen, with effect from 1 November 1866. If the M&MR actually ran into Pencader station using a third rail from 1 January 1866 there would have been little point in building an interchange station half-a-mile to the north. If not, the engine shed must have opened at a later date. At an unknown date the shed was converted to two-road; it closed on 2 March 1918. Pencader station closed to passengers on 22 February 1965, but the station remained open to handle parcels until 6 September 1965. The down line was quickly lifted, and the platform which was built into the valley side was demolished. The buildings on the up platform were also demolished, with the exception of the gents' toilet. After complete closure of the line in September 1973 the remaining track was lifted in late 1975 or early 1976. In 1845 there was a proposal to build a branch line from Carmarthen to Cardigan at the mouth of the River Taf as part of the planned Great North and South Wales & Worcester Railway; nothing came of this scheme. The South Wales Railway opened its broad gauge line from Chepstow to Swansea in 1850, extending to Carmarthen in 1852 with the intention of eventually reaching Neyland. The Carmarthen & Cardigan Railway Company was formed in 1854 to promote a broad gauge railway from a junction with the SWR at Carmarthen. Initially the line would terminate at Newcastle Emlyn, a distance of 26¾ miles, later to be extended 12 miles to Cardigan where the company intended to build a deep-water port. The Carmarthen & Cardigan Railway was incorporated by an Act of 1 July 1854 to build the line between Carmarthen and Newcastle Emlyn. There was authorised capital of £300,000 with powers to borrow a further £80,000. City of London-based contractor John Jay was employed to build the line. Jay's previous railway contracts included Stoke-on-Trent railway station, and a section of the Great Northern Railway north of King's Cross together with King's Cross goods station and passenger terminus; these were all built around 1850. The line was to be constructed in two stages, with the first 18-mile section linking Carmarthen and LLandyssil. Work started a mile south of Carmarthen following the ‘turning of the first sod’ in March 1857; a junction was made with the South Wales Railway at Myrtle Hill. The main engineering obstacles facing engineer Joseph Cubitt were the construction of a crossing over the River Towy at Carmarthen and the excavation of a tunnel between the valleys of Skanda Vale and Dolgran, under the Brechfa Forest south-west of Pencader. During construction in 1859, the C & CR attempted to switch from broad gauge to standard gauge, which would have meant that all railway infrastructure could be built to smaller (and thus cheaper) dimensions. Such a change would require the approval of Parliament, and pressure was put on the company by the South Wales Railway which did not want the rival standard gauge making an incursion on its territory; a Bill authorising this change of gauge was never put before Parliament. its own rolling stock on 15 August 1861. In October 1861 Bronwydd Arms, a new station between Carmarthen and Conwil, first appeared in company timetables. Progress north now slowed owing to problems during the construction of the 895yd Pencader tunnel (also known locally as Alltwalis Tunnel and Dolgran Tunnel). The digging required two construction shafts which could then be used for ventilation. Construction started in the spring of 1857, and digging initially proceeded from four sites - at either end and from the bottom of both ventilation shafts. Work was expected to be completed by December 1860/January 1861. The tunnel was 'finished' in March 1861 although, at that time, it was exposed rock without a brick lining and required further work to complete it. The long approach cuttings were also unfinished. During construction of the tunnel, many of the horses used to haul away excavated rock died from disease and were buried in the field surrounding the northern of the two shafts. The same field also has grassed-over rubble remaining from cottages built by the construction navvies. Much of the spoil excavated was used to build embankments north and south of the tunnel, but large spoil heaps can still be seen on the hillsides around both ventilation shafts. Further delays were caused by the original contractor, John Jay, abandoning the construction of the line in autumn 1861. By November, however, another contractor, Holdens, took over the construction. Work was then focused on finishing several miles of railway either side of the tunnel and, although easy to the north, to the south heavy engineering of cuttings and embankments slowed progress. The 12-mile extension to Cardigan was authorized by an Act of 1 July 1863 but it was never built. Track is known to have been laid through Pencader Tunnel at some point prior to December 1863. An official Board of Trade inspection was carried out in January 1864, and the tunnel opened with the rest of the Llanpumpsaint-Pencader section on 28 March 1864. At that time the tunnel was still unlined, and a watchman was employed to inspect it for any rock falls until it was eventually lined with brick some years later. The line reached Llandyssil, a further 3½ miles, on 3 June 1864 with a service of four trains in each direction, taking approximately 70 minutes between Carmarthen Town and Llandyssil. Most trains started or completed their journeys at Carmarthen Junction station. By now the high cost of construction, especially Pencader Tunnel and the purchase of two tank engines from Rothwell & Co, had drained the company’s resources and it was forced into bankruptcy. A Receiver was appointed to run the railway without any interruption to the service. The tank engines were sold but were leased back to the Receiver. In 1860 the Manchester & Milford Railway received Royal Assent to build a line from the C & CR at Pencader to Llanidloes. In 1861 a route was proposed north, mainly along the east side of the River Teifi valley from Pencader to Devil’s Bridge. There, a junction station would be constructed, with the main line proceeding to Llanidloes, and a branch line to Aberystwyth. Work on the southern section of the line progressed rapidly, and the line from Pencader to Lampeter was opened on 1 January 1866. The M & MR made a junction with the C & CR half-a-mile north of Pencader. However, because of the gauge difference the two lines didn't actually join, and a new interchange station called Pencader Junction was opened with the new line. The next section from Lampeter to Strata Florida was completed by 1 September 1866, and the final section to Aberystwyth by August 1867. The South Wales Railway had been taken over by the GWR in 1862. By that time broad gauge was in decline and, in order to allow through running between the C & CR and the newly opened M & MR, the 13¾ miles from Abergwili Junction to Pencader Junction were altered to mixed gauge on 1 November 1866. The M & MR was given running rights into Carmarthen, but its trains were not permitted to call at intermediate stations. The C & CR directors regained control of their line in 1867. The remainder of the line to Llandyssil was converted to standard gauge on 1 June 1872, and all broad gauge running ceased from that date. In September 1869 the C & CR formed a new company for extending the line to Newcastle Emlyn and eventually on to Cardigan, but the proposed extension failed to get sufficient local support. An approach was made to the London & North Western Railway to buy the line and build the extension to Newcastle Emlyn, but nothing came of this. In 1881, a Bill was put before Parliament authorising the C & CR to extend its line to Newcastle Emlyn, reduce the number of directors, and sell or lease its undertaking. On 4 March 1881 an Agreement leasing the C & CR to the GWR was approved by the House of Lords. Under GWR control the service was reduced to three down trains between Carmarthen and Llandyssil, but still four up trains The M & MR timetable of the same date showed three through trains in each direction between Carmarthen and Aberystwyth, with an extra morning service in each direction between Carmarthen and Lampeter. On 1 July 1882 the C & CR was absorbed into the GWR. All the necessary land for the extension was purchased by April 1885 but the GWR, who had been reluctant to build the line, ensured that work progressed as slowly as possible, taking over ten years to reach Newcastle Emlyn. 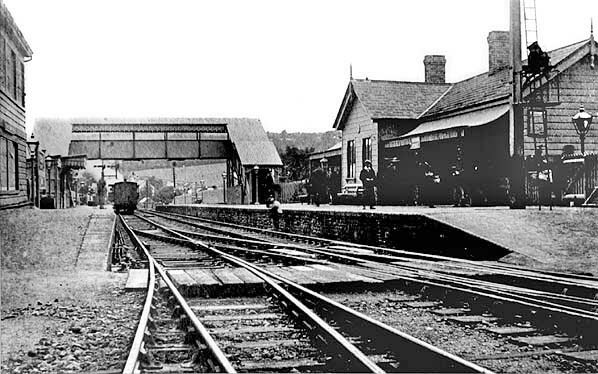 The extension finally opened on 1 July 1895 with one intermediate station at Henllan. 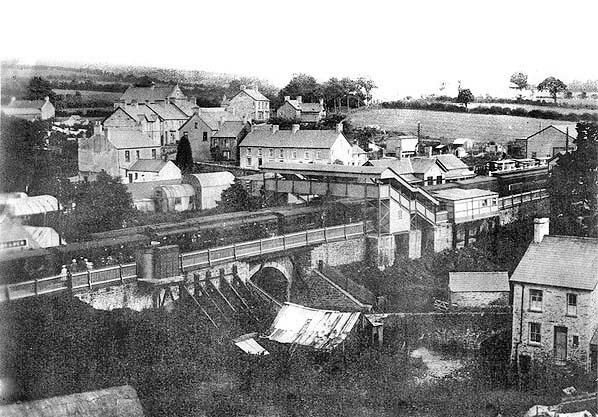 The long-awaited railway was given a riotous reception by the townspeople and traders of Newcastle Emlyn. The opening train was decorated with flags and flowers, and in the afternoon about two thousand people sat down to tea in the New Market House. In the evening a grand banquet was held in the Emlyn Arms Hotel. 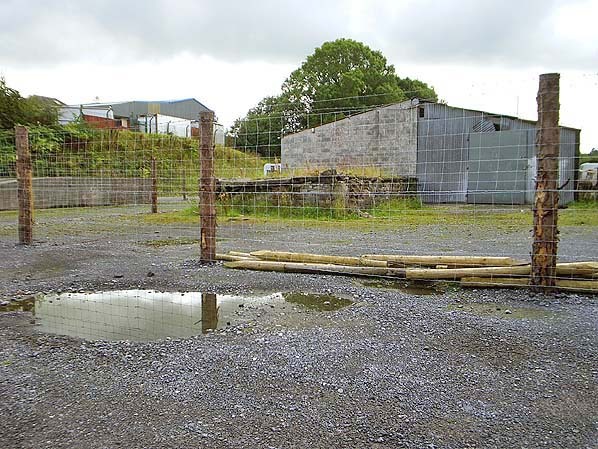 A further extension to Cardigan was now ruled out, largely because of opposition to the intrusion of the line into an area of natural beauty that had become a popular tourist attraction. Consequently the GWR had to make do with a motor bus service from Newcastle Emlyn to Cardigan. A second intermediate station called Pentrecourt Platform opened on 1 February 1912. The timetable for 1902 showed a daily service of four trains in each direction between Carmarthen and Newcastle Emlyn. On Saturdays there were two extra trains to Llandyssil only. There was no Sunday service. The M & M timetable for the same date shows four trains between Pencader and Aberystwyth, with three in the opposite direction. 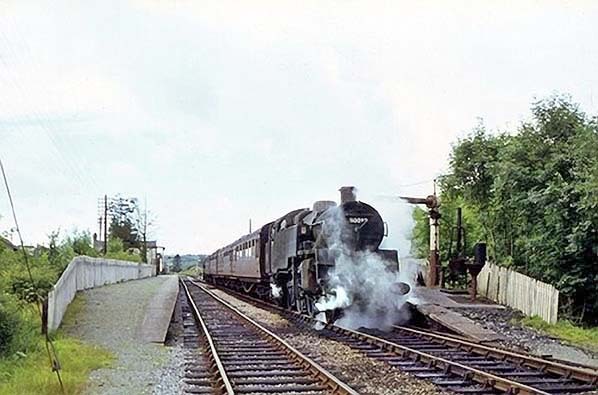 There was an early morning Saturdays-only train between Lampeter and Pencader, to connect with the morning Newcastle Emlyn to Carmarthen service. The Manchester & Milford Railway was leased by the Great Western in 1906 and absorbed in 1911. Carmarthen to Aberystwyth then became the main line, with the Pencader- Newcastle Emlyn line operated as a branch. The GWR opened a branch from Lampeter to Aberayron on 12 May 1911.
where trains trundled along, often flagged down by market-bound farmers' wives making their way across the fields to board the carriages. In fact, nearly three hours were permitted for the 56-mile journey between Carmarthen and Aberystwyth. The Second World War brought a new lease of life as a relief route providing a vital link for northbound traffic, with regular movements of heavy munitions to Chester. After the war the line settled back to a quieter existence. With the ever-increasing popularity of the car, especially after WW2, the Teifi Valley lines clearly had no future under a nationalised British Railways. The Aberayron branch was the first to lose its passenger service from 2 February 1951. 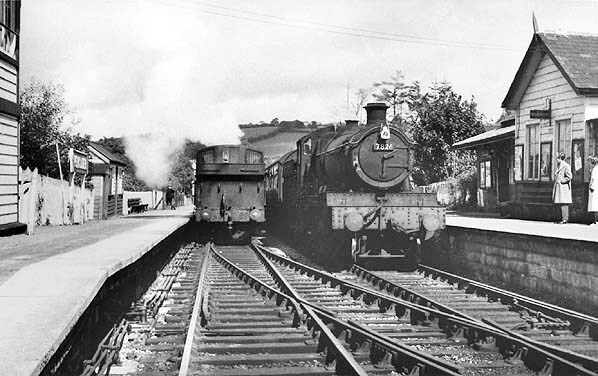 Passenger services lasted a little longer on the Pencader-Newcastle Emlyn branch, with the last train running on 13 September 1952. 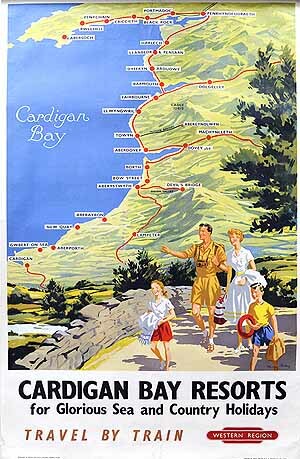 The main line enjoyed a brief resurgence in the 1950s when the Royal Train traversed the route, and other new traffic included Butlins through-specials taking holidaymakers to the new camp at Pwllheli. By the end of the fifties, there were three weekday trains each way (four on Saturdays) with a journey time of around 2½ hours with 16 timetabled stops and another 5 request stops. Declining passenger figures meant that the Beeching Axe was inevitable; in the end, however, it was nature that struck the first blow. Heavy flooding severed the line six miles from Aberystwyth in December 1964, in the same weekend that storms caused the Ruabon to Barmouth Line to suffer a similar washout. The last passenger train ran along the truncated route south of Strata Florida on 22 February 1965; inexplicably the BR network map dated 1965 showed Pencarreg, rather than Strata Florida, as the temporary northern terminus. The line remained open for freight using Hymek locomotives until around 1970, then by Class 37 locomotives. Despite closure to passengers, the branch lines also remained open for freight traffic. Withdrawal of freight facilities at individual stations started in December 1963. 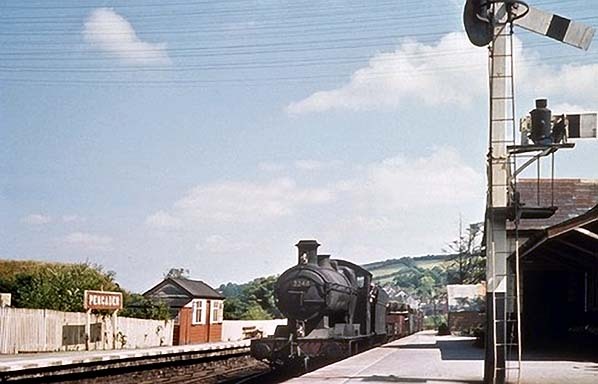 By 1965 freight-handling had ceased at all stations except Lampeter and Newcastle Emlyn, which then became railheads. Scheduled for complete closure at the end of 1972, the Newcastle Emlyn branch received a number of reprieves. The Teifi Valley Railway Preservation Society was formed in October 1972 with the intention of purchasing the Carmarthen-Newcastle Emlyn section for the operation of a steam-hauled tourist passenger service. Special excursion trains were chartered from British Rail giving hundreds of people their first opportunity of travelling on the line and seeing for themselves the outstanding countryside through which it passed. Negotiations were opened with British Rail for the purchase of both land and track, and a stay of execution was obtained on the lifting of the line. However, the enthusiasts were faced with two insurmountable problems. Month by month the price of the track increased, frequently by tens of thousands of pounds, only to be aggravated by a serious shortage of steel, which put railway track at a premium. The second problem was the lack of local interest and support. Although offers of help poured in from all over the country, local working parties rarely attracted more than a dozen-or-so people, from a total membership of 200. The end came in 1973 for both the Newcastle Emlyn branch and the main line from Carmarthen to Lampeter with the end of the milk traffic. 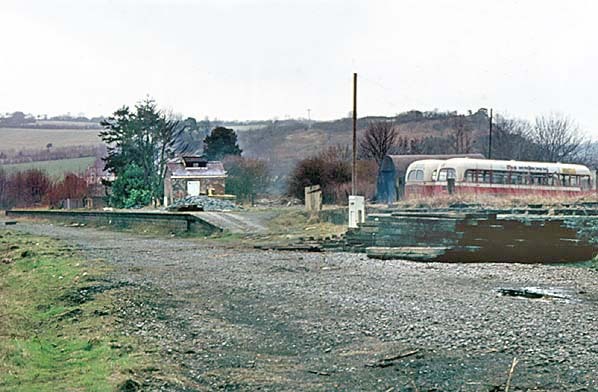 The last passenger train over both lines was the RCTS Farewell to the Teifi Valley Milk Branches railtour on 30 December 1972.
remained in service until discontinued by British Rail in 1973; this resulted in the final closure of the line. Track was left in place until the summer of 1975. Two years after its closure, the Gwili Railway Preservation Company was formed with the ambition to preserve at least eight miles of track of the former route, from Abergwili Junction along the Gwili Valley to the station site at Llanpumpsaint. Track-lifting had already started by the time of the formation of the new company and, as a result, only a mile of track north of Bronwydd Arms was left in situ. The Company was, however, able to acquire the full eight-mile stretch of trackbed from Abergwili Junction to Llanpumpsaint for both rebuilding and preserving. Over time the railway has extended the operational length from one mile to 2½ miles, with its current northern terminus at Danycoed. The society is currently focusing its attention on a southward extension towards a proposed Carmarthen North station. Since the preservation society owns the trackbed as far as Abergwili Junction, two miles south of Bronwydd Arms, a new station can be constructed alongside the new Carmarthen eastern bypass. This will, hopefully, greatly improve visibility of the railway to passing traffic on this busy road compared to the less conspicuously sited Bronwydd Arms station. Once the southern extension of the Gwili Railway is complete, it will increase the length of the route to around 4½ miles. Reconnection with Carmarthen railway station is currently impossible as the bridge that once carried the line over the River Towy was demolished in the 1980s. Although attempts to preserve a standard-gauge line to Newcastle Emlyn were not successful, a restoration project eventually got under way in 1981 when a group of enthusiasts bought part of the trackbed at Henllan. In 1983, with the help of funding and labour from the Manpower Services Commission, they laid a 2ft-gauge track from Henllan to Pontprenshitw, where passengers were invited to take a short walk to admire the waterfall under the railway bridge. In 1987 the Teifi Valley Railway was extended as far as Llandyfriog and, since 2006, has been further extended to the current end of the line at Llandyfriog Riverside. 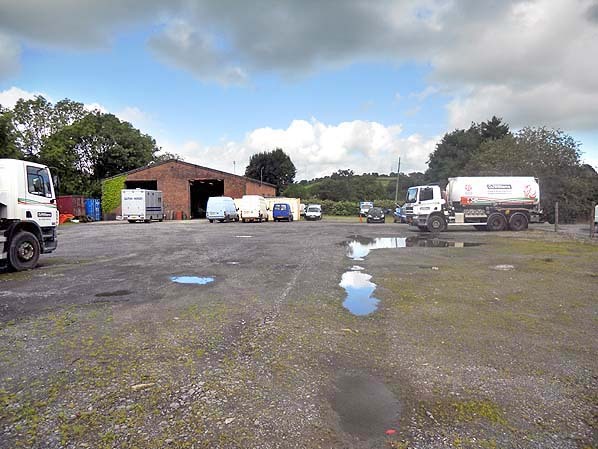 During spring 2009 work proceeded to re-site Henllan station to its original location on the opposite side of the road. This new platform was brought into use in July 2009. 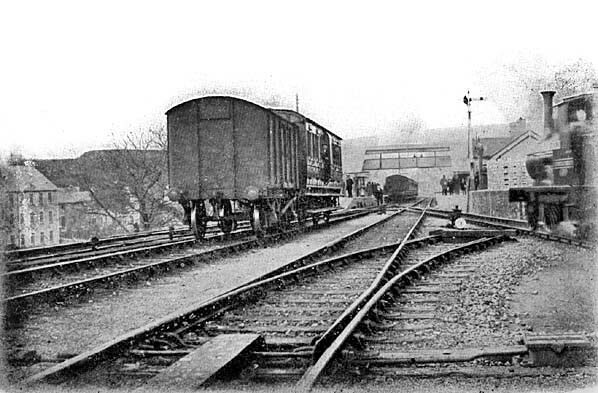 Looking north towards Pencader station c.1903; the cattle dock and pens are seen on the right. 1899 1:2,500 OS map. At this time there was no signal box and no footbridge. The single-road engine shed to the south of the station on the down side was opened by the Manchester & Milford Railway on 1 November 1866. 1899 1:2,500 OS map. The signal box and footbridge have now been built. The engine shed has been converted to two-road, it closed on 2 March 1918. A saw-mill is identified to the east of the main station building with a tramway running to it from a siding in the goods yard. 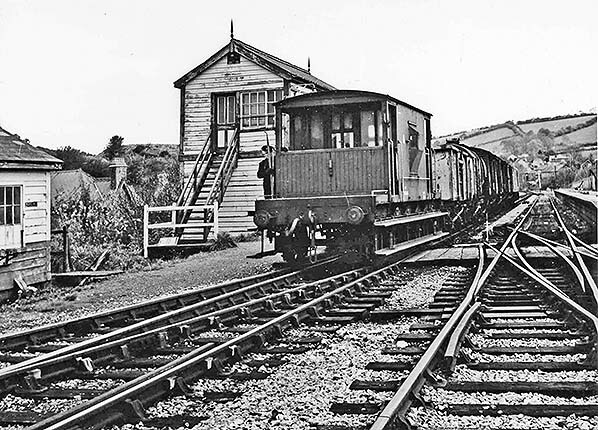 It is assumed this tramway was narrow-gauge as the map shows that the siding did not actually join the tramway. Pencader station looking north in July 1904. Looking south east towards Pencader station in the early years of the twentieth century. The station is built along the edge of the valley; note the timber buttresses. The station platforms straddle Castle Road, which can be seen running under the line. The large goods shed is seen on the far right. 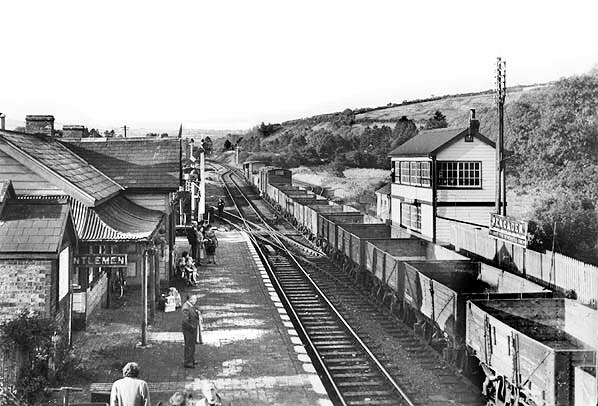 Pencader station looking south from the footbridge in September 1952. The unusual design of the main station building is clearly seen in this view. The two-level signal box is unusually tall. A northbound freight train is passing the down platform. A busy scene scene at Pencader station c. 1960s. A southbound passenger train for Carmarthen pulls into the up platform. 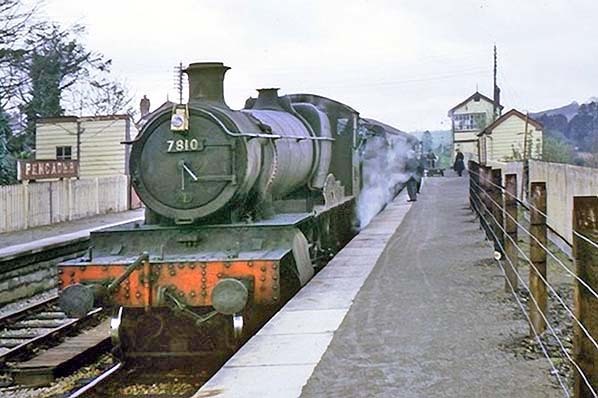 7826 was built at Swindon Works by BR in December 1950. Named 'Longworth Manor' after the building in Oxfordshire, this loco was withdrawn from Cardiff East Dock after 14 years service in April 1965 and cut up in July of that year. A southbound class H freight (denoted by the two headlamps) passes through Pencader station in the 1960s hauled by an unidentified 22XX Collett 0-6-0 tender loco. Built at Swindon by the GWR between 1930 and 1945, this class of 120 locos was seen all over the GWR. A light axle loaded mixed traffic loco, it was equally at home on passenger and freight workings. All were withdrawn by the end of June 1965, and only one (3205) has been preserved. A passenger train bound for Aberystwyth takes on water at the end of the down platform at Pencader station in August 1963. Brake van trip from Carmarthen to Newcastle Emlyn is seen at Pencader on 18 October, 1967. The front portion of the train is being shunted into the refuge siding, from where it will be collected by another locomotive later in the day. 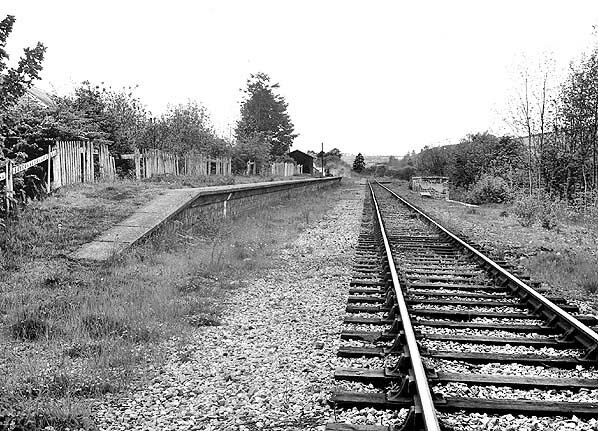 Pencader station looking south c. 1970. After closure to passengers the down platform, which was built into the side of a steep slope, was quickly demolished, as were the buildings on the up platform, except the gents' toilet. The goods shed can be seen in the background The line remained in use until September 1973. Pencader station in February 1976 shortly after the track was lifted. Old sleepers are piled up against the cattle dock awaiting collection. The gents' toilet is the only platform building still standing. In September 2010 the cattle dock is the only surviving part of Pencader station. The site of Pencader station looking north in September 2012.